P0994. WILHELM KEMPFF: Sonata #2 in a, Op.2, #2, recorded 1940; Hammerklavier Sonata #29 in B-flat, Op.106, recorded 1936 (both Beethoven). (Canada) St Laurent Studio YSL 78-011. Transfers by Yves St Laurent. “One of the twentieth century's most important pianists, Wilhelm Kempff found warmth in Beethoven where many others discovered only stress and passion. Concentrating on the composers of the late Classical and early-to-middle Romantic periods, Kempff achieved graceful, amiable results while not neglecting the sterner core of this music. His nobility of purpose was everywhere evident, made manifest through lucid textures, an adherence to a flowing legato, and tonal shading. In addition, he was a composer whose oeuvre included two symphonies, four operas, songs, and solo piano works. In 1914, Kempff traveled to Potsdam for studies at the Viktoriagymnasium before returning to Berlin to finish his work at the Hochschule and enroll at the university. At age 20, Kempff served as organist and pianist on a tour of Germany and Scandinavia by the Berlin Cathedral Choir. A successful 1917 piano recital at the Berlin Singakademie led to an engagement the following year with the Berlin Philharmonic, the first of innumerable collaborations with that august ensemble. During the 1920s and 1930s, he toured South America and Japan, as well as many parts of Europe, adding to his reputation for uncompromising musicianship and personable interpretation. At the same time, he taught, serving first as director at the Stuttgart Musikhochschule from 1924 to 1929 and, later, as piano instructor at Potsdam's Mamorpalais for the decade before WWII. The war kept his activities confined to Germany, but with its end, Kempff once more resumed a busy performance schedule. England and America heard Kempff only later. In London, the public, including a large number of German émigrés, applauded him upon his first appearance there in 1951. Not until 1964 did New York hear the pianist in person, although by then his many Deutsche Grammophon recordings had already established his stature for Americans. 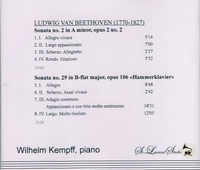 Indeed, Kempff's long and fruitful relationship with that label had brought to the market a long list of desirable recordings, among them the complete Beethoven piano concerti; the sonatas; a relaxed, but rewarding survey with Wolfgang Schneiderhan of the Beethoven violin sonatas; and various collections of Schubert, Schumann, Chopin, and Brahms." “Wilhelm Kempff describes the environment in which he grew up as an environment steeped in music and Protestantism. Within his strong family tradition of church organists, he heard Bach’s organ repertoire daily, as well as the conversations among family members about Bach’s organ chorales and the Lutheran faith. His family background was strongly linked to Kempff’s musical life. Furthermore, the educational reform that occurred in the State of Prussia at the beginning of the nineteenth century had an impact on Kempff’s family. As a part of the new education system, music was emphasized as a core and mandatory subject for preparation of the sacred service. With this educational reform system, church music and public school education were closely connected. His first teacher was his father, also named Wilhelm Kempff. After subsequent lessons with Ida Schmidt-Schlesicke, he entered the Berlin Hochschule fur Musik at the age of 9. In 1906 Kempff began to study composition with Robert Kahn and in 1909 he studied piano with Heinrich Barth who was the premier piano and organ pedagogue in Prussia at that time. He played to Busoni, heard Eugen d’Albert (one of Liszt’s greatest pupils), and his own teacher, Heinrich Barth, and had been a prize pupil of Hans von Bülow, Liszt’s son-in-law. Kempff wrote about d’Albert and Busoni in detail in his autobiography. These two great pianists, both of whom transcribed Bach’s organ chorale preludes for solo piano, were important musical influences for Kempff. Eugen d’Albert was the first pianist about whom Kempff wrote in his autobiography. In 1924 when Kempff was twenty-nine years old, he was appointed the director of the Württembergische Hochschule für Musik in Stuttgart. He also taught piano classes and conducted his own compositions from 1924-1929. In addition, Kempff also implemented a new department for church music. Kempff’s work with his piano class at the Wurttemberg Conservatory was highly successful from the very beginning. The friendly and relaxed relationship with his students was a precursor for the way he would later conduct his summer courses, first in Potsdam, and after World War II, in Positano. After his directorship at the conservatory in Stuttgart, Kempff began teaching and directing the summer courses for piano in Potsdam, Deutsches Musikinstitut für Ausländer-Sommerkurse in Potsdam. The summer courses allowed him to teach advanced students from around the world. In the summer course Kempff worked with colleagues such as Edwin Fischer, Eugen D’Albert, Leonid Kreutzer, and Walter Gieseking as well as other musicians. During the next decades Mr. Kempff made concert tours of Germany, Scandinavia, South America and Japan. He rode on the Graf Zeppelin to Buenos Aires in 1934 for a tour; the dirigible received extensive press coverage and was met by a crowd estimated in the millions. Kempff’s début in England was 17 June, 1935 at the Aeolian Hall in London performing a recital with the violinist Cecilia Hansen. During World War II, he performed mostly in Germany and occupied countries by the Germans. He returned to the Paris concert stage 22 November, 1948 and to London 27 October, 1951 at Wigmore Hall. His America début happened during the later years of his life when he gave a recital in Carnegie Hall 15 October, 1964. In 1957 he began to direct Beethoven courses at Positano, Italy, and maintained a home there thereafter. Until late in life, he regularly offered informal advice to young musicians who would visit him at his home. His last recital was given in Holzhausen, Germany 31 July, 1982. He had suffered from Parkinson’s disease in his last years and died on 23 May, 1991 at his home in Positano, Italy. He was 95 years old.